The high bird dog plank is an excellent whole-body functional exercise for strengthening your core and improving your balance and coordination. Targeting your lower pectoralis major, the point of the shoulder tap push-up is to put your body off balance and force stabilizer muscles to work harder. 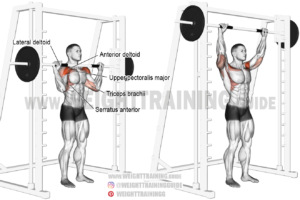 Work your shoulders using the double cable front raise, an isolation exercise that targets your anterior delts and synergistically works your lateral delts.